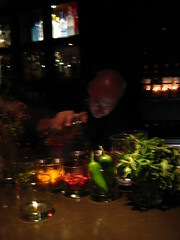 While in LA we went out for drinks with our pal hedge and wound up at the Library Bar in the Hollywood Roosevelt hotel. Hedge met Matt the bartender at the farmer’s market that morning by happenstance and when we suggested drinks she had just the place to try. – wo kaffir lime drinks…. one with cherry liqueur foam — we’d prefer an orange foam or no foam in that one. I much preferred the kaffir lime, Hendrick’s, coconut milk thing he whipped up for the folks next to us (he gave us a sample). We got a couple tastes of his saffron vodka and fresh coconut/pineapple rum, both quite interesting and complex. And then he whipped up a new drink on the spot based on a single phrase: Just The Tip. This ended up being a multi-part extravaganza in a nipped-waist vessel, with a 20 yr Pappy Van Winkle old fashioned in the bottom, followed by a cherry to block the narrow part of the glass, then lemon, sugar, aperol, and possibly vodka in the top section, with cherry foam on just the tip. Insane. Awesome. 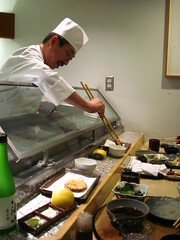 We went to the fancy tempura bar here in LA at the Kyoto Grand hotel, where they sit you at the bar and the tempura master brings you morsel after morsel. The master barked orders at the waiters just like in the sushi bar scene with Hattori Hanzo in Kill Bill, which we found entirely charming in its absurdity. We got a bit of sashimi and some jellyfish and mountain vegetable in sesame sauce to start, and then the parade of fried goodness began. There was a lemon wedge and some green tea salt to dip in, which I rather enjoyed as an occasional break from the delicious ponzu with daikon. The best of them were the astonishingly tender squid and the delectable orange roughy with green onion, though I enjoyed them all, from the asparagus to the eggplant to the lotus root to the crab claw to the unagi to the shiitake. Nom nom.